Meeting David Addamo at his cozy new Pismo Beach tasting room, my first question for the winemaker and entrepreneur was: Why did you choose the name Red Carpet Winery? He replied: “In Hollywood, they roll out the red carpet for the best of the best. When it comes to wine with your dinner, I want to offer the best of the best.” I learned that his Red Carpet Winery brand features several varieties: Chardonnay, Pinot Noir, and Syrah, which he considers his top-shelf brand or reserve wines. But there’s more at Red Carpet Winery’s new Pismo tasting room. SEEING RED : David Addamo opened Red Carpet Winery in Pismo Beach this year, and his daughter Nicole manages the tasting room. The space, including the huge patio, is available for parties—and the Addamos certainly know how to celebrate. Addamo has a second brand named Fifty Shades. The first release is a 2011 Central Coast Syrah that sports a contemporary label with psychedelic purple/pink lips, which will also be sold in Albertsons. A Fifty Shades Chardonnay will be released on April 2 at the tasting room. Red Carpet will always be limited to the tasting room and select restaurants. Addamo has good reason to be excited about his Red Carpet and Fifty Shades wines. The 2013 San Francisco Chronicle Wine Competition awarded him a gold medal for his first release of Red Carpet Winery 2011 Pinot Noir grown in Santa Maria Valley. He also earned silver medals for his 2011 Santa Maria Valley Syrahs under Red Carpet and Fifty Shades. I wasn’t surprised when he mentioned the awards; that Pinot Noir was my favorite of his wines before I knew about the trophy. The Pinot is grown at his former neighbors’ home in Santa Maria Valley, owned by Victoria and Doug King. Addamo also makes the Kings’ Pinot Noir under the label Royal Flight; it’s sold at the Pismo Beach tasting room. ROLL OUT! : Red Carpet Winery is at 1300 Price St. in Pismo Beach. For more information, call 863-8111 or visit redcarpetwinery.com. An entrepreneur since he was 18, Addamo recalled that his first business was an Italian deli. He opened his first winery in 2005—Addamo Vineyards—and made his wines in Santa Maria Valley. 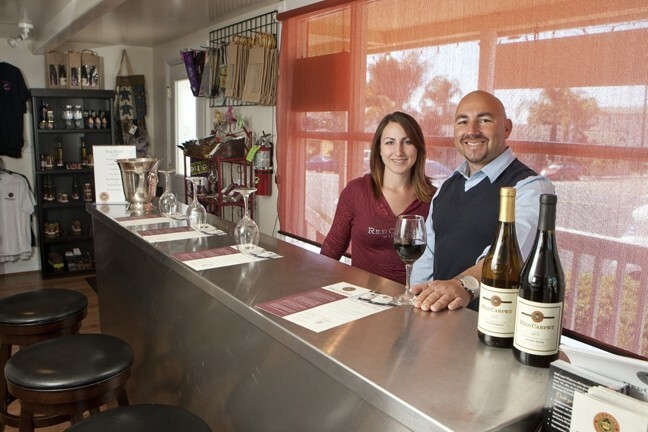 The wines were sold at the Addamo Tasting Room in Old Orcutt, which features a bistro menu. Explaining that Addamo Vineyards grew too rapidly (it was producing 12,000 cases annually, which far exceeded what he wanted his brand to represent) he said that last year he sold that brand to another company, but the sale didn’t include the Old Orcutt tasting room. Although he’s sad about selling it, he’s focused on making artisan wines, producing only 1,200 cases annually, and he admitted he’s much happier. MID-WEEK MUSIC: Red Carpet Winery’s Wednesday Wine Down means every Wednesday night from 6 to 9 p.m. you can enjoy complimentary live music and appetizers simply by purchasing a glass or bottle of wine from Red Carpet Winery or Fifty Shades in Pismo Beach. Entrepreneur David Addamo knows how to charm his customers, and his Red Carpet Winery/Fifty Shades tasting room is attracting locals who quickly sign up as wine club members. Many of their neighbors come to events in groups so they can buy wines by the bottle to share while they taste homemade recipes by Lorraine Addamo (David’s sister), a professional caterer. She prepares all of the food herself, and many recipes are originals the Addamo family brought over from Italy. Louis Ortega, among other musicians, appears regularly, and the multi-talented Addamo loves to accompany them on his drums. He plans to add live music on Friday and Saturday nights soon. The Addamo family and their staff assure a good time is had by all, and all of this is provided with no cover charge. The new spring hours at the Pismo Beach tasting room have been extended from noon to 9 p.m. daily. I attended the grand opening in Pismo Beach on Jan. 25, and discovered the Addamo family throws one helluva party. They generously provided each guest with a wineglass and three wine tasting tickets, a buffet filled with an array of foods, and entertainment by a great band. Addamo explained that this is the norm from his family; each new wine release is good reason for a party. Typically that’s three times a year, and then they find other reasons to celebrate. Even if you don’t belong to the wine club, you can go to an event and sign up for the club, which provides complimentary entry and gets you exclusive invitation-only events, wine discounts, and more. In fact, wine club members receive free tasting at all three of Addamo’s tasting rooms, one of which he shares with Cottonwood Canyon in Santa Maria Valley, where he now makes his wines. Since it’s a family-run business, the Addamos are always there to see to their clients’ needs. Daughter Nicole Addamo manages the tasting room, and you’ll usually find David there. To set themselves apart from other tasting rooms, Red Carpet in Pismo will gladly accommodate special private events, baby showers, wedding receptions, or anniversary parties with advance reservations. I’ve come to know quite a bit more about this savvy entrepreneur. David knows how to make people happy, and that has placed his tasting room in a prominent position on the map in SLO’s South County wine country.